Free Printable Baby Shower Invitations ... free baby shower printables invitations from Sacco Bambino®. Cute Monkeys, Turtles, Hot Rods, Frogs and Barnyard Animals ... and they're all free! Select from our adorable Monkey Around or Wild Monkeys Bambino invitations. Pink Save The Turtles or Barn Yard Bambino Invites ...Or our Hot Rod Race Cars and Camo Frogs! Free baby shower printables in invitation designs that go with many baby shower themes. Free Printable Baby Shower Invitations to download right now. And when you subscribe to our Free Sacco Bambino Newsletter, you'll get access to All of our free baby shower invitations! Subscribe now and receive access to our Free Baby Shower Invitations Library. Save a bundle on free baby shower printables invitations with a new design periodically that you won't see anywhere else. Look for the "Keep In Touch!" link on the upper left side of each page ... it's free! 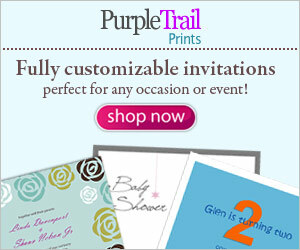 All of our free invites are easy to download and print. The layout is set up to print 4 per 8-1/2" X 11" page. Select a thick, slightly textured paper, or a card stock 110 lb. or slightly thicker, depending on your personal preference. Are You The Lucky Hostess? Are you hosting a shower for Mom-To-Be? If so, we have some great selections to coordinate invitations with your Sacco Bambino® purchase. Visit our Sacco Bambino® Gift Shop for Unique Baby Gifts to Surpise Mom-To-Be with a gift that coordinates with your free printable baby shower invitations. Enjoy! Also Available in Postcard Invitations! Looking For More Baby Shower Printables In Unique New Invitation Designs? We have more Monkey Baby Shower Invitations in boys and girls designs. Visit our Printable Baby Shower Invitations page. Important Notice: Sacco Bambino® Free Baby Shower Invitations are copyrighted items and are for Personal Use Only. Not for resale, commercial use or mass distribution.